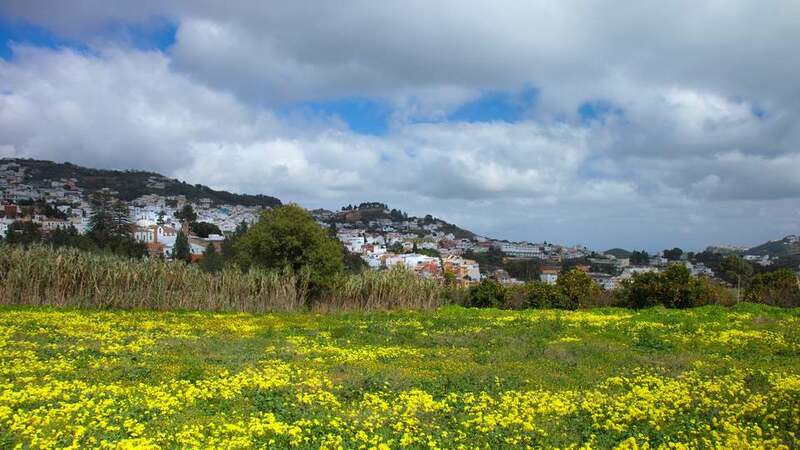 Celebrated as a pilgrimage destination, Teror is the very core of faith in Gran Canaria. Even vacationers of different beliefs flock here, though, and for great reasons. Surrounded by breathtaking mountains, unwinding is here is as natural as breathing. Its calle of historical, colorful houses take them back in time in a fascinating way. When there’s a need to relax and still get enthralled, this northern town is ready for the job. In 1481, a group of shepherds saw an apparition of the Virgin Mary on top of a pine tree. It was that year and that moment that forever shifted the course of history for the modest Teror. By 1590, the town, home to a still humble chapel, was befittingly proclaimed Villa Mariana. At only 50 square meters, the chapel was no longer enough for the growing number of parishioners. By 1760, a new and most definitely larger one had to be constructed. It wasn’t after a couple of decades that it finished, though, as it was made part by part, little by little. Prior to the completion of what we now call the Basilica of Our Lady of the Pine, another milestone occurred. In 1607, the first descent of the image of the Virgen del Pino to Las Palmas de Gran Canaria took place. No one would have imagined then how big and important this event would eventually become not only for the townspeople but for the whole island. By the 18th century, Villa Mariana de Teror became a figure of prosperity. Besides its religious relevance, the town was rich in natural resources. Its fertile soil is perfect for agriculture. Water is overflowing and clean. Most importantly, it had space to cater to a growing population. Even the most important families of Gran Canaria moved here. Their financial power and exquisite taste evident in the historic street of Teror. Teror is relatively small at only 25.70 km², but it is brimming with engaging attractions. As mountainous landscape encircles the whole urban area, nature lovers are in for a treat. Natural scenery is basically within reach and in sight at all times. Never failing to amuse are the creations of human hands. Although impressive, they are entertaining more than intimidating. 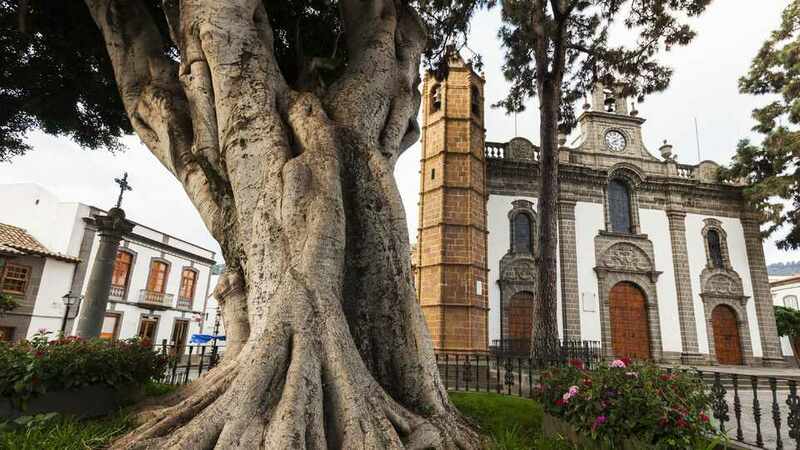 It took five long decades to finish the lovely Basílica de Nuestra Señora del Pino. For Teror’s most known structure, though, that still wasn’t enough. To preserve its pristine condition, it also went through several renovations. Housing Gran Canaria’s patroness, the Virgen del Pino, it’s a must-visit for pilgrims. 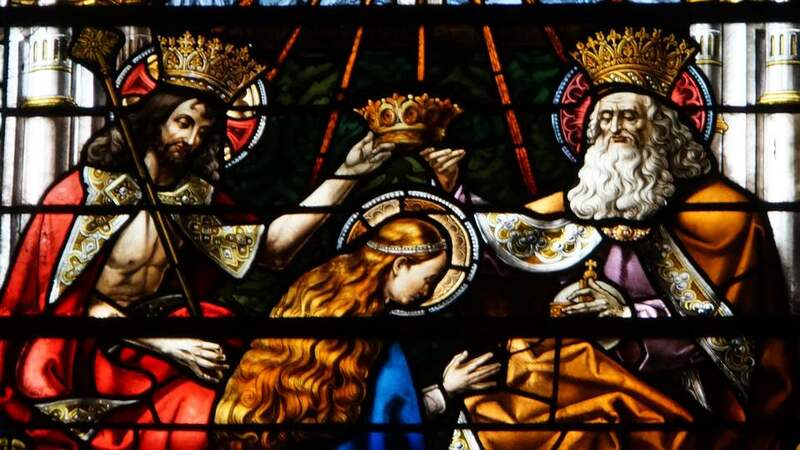 And, every year, the three-nave building adorned with remarkable stained glass portraits awaits. Here, devotees offer fresh produce and renew their unwavering faith. 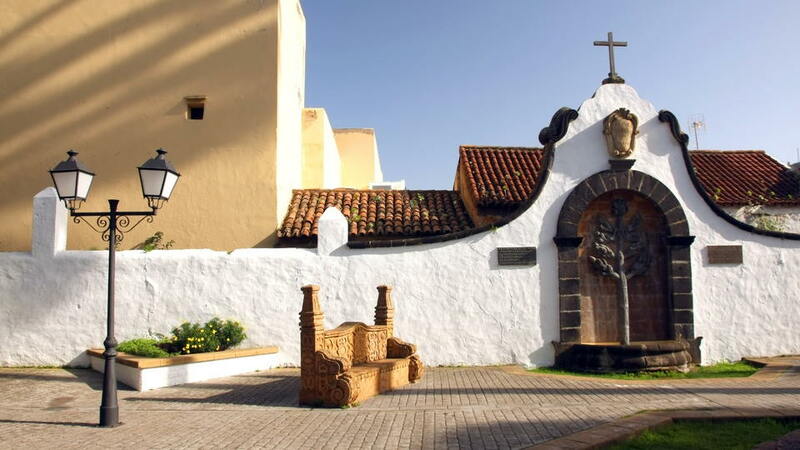 Most villages and towns in the entire Canary Islands are of whitewashed structures. From houses, churches, restaurants, to municipal hall, alabaster is what they proudly sport. It has been the brand of Canarian architecture, and it indeed is stunning. Calle Real de la Plaza, though, has defied the norms, and time too. 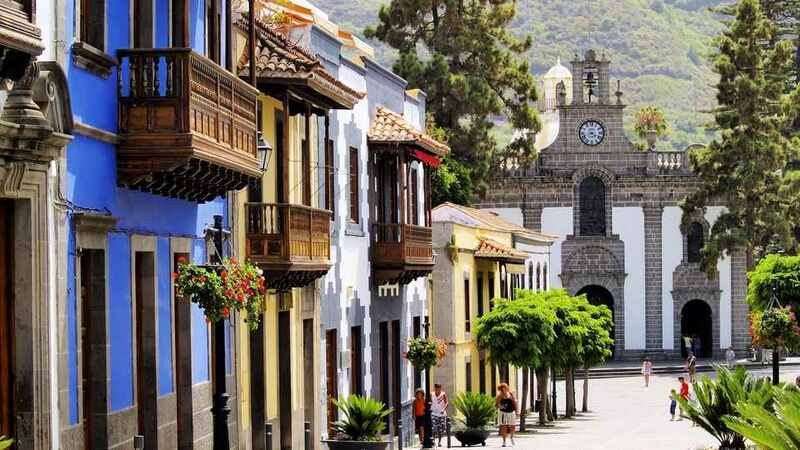 Claimed by many as Gran Canaria’s most colorful street, it consists of vibrant, colonial-style, two-story abodes. These old houses, some dating from way back 16th century, are far from their boxy and white counterparts as they have more character. Each with different hues and well-preserved, they also boast intricate wooden balconies. Walking in this concrete stretch feels like going back in time in the most relaxing way. What’s more fantastic is that some have been turned into shops, so sightseers can also go shopping. To take the blast from the past experience a notch higher, visit Casa Museo de los Patronos de la Virgen. It’s like a giant doll house from a bygone period as it fitted with everything from yesteryears. To get to know the old Gran Canaria and the lifestyle of that era’s nobles, don’t miss this mansion turned museum. 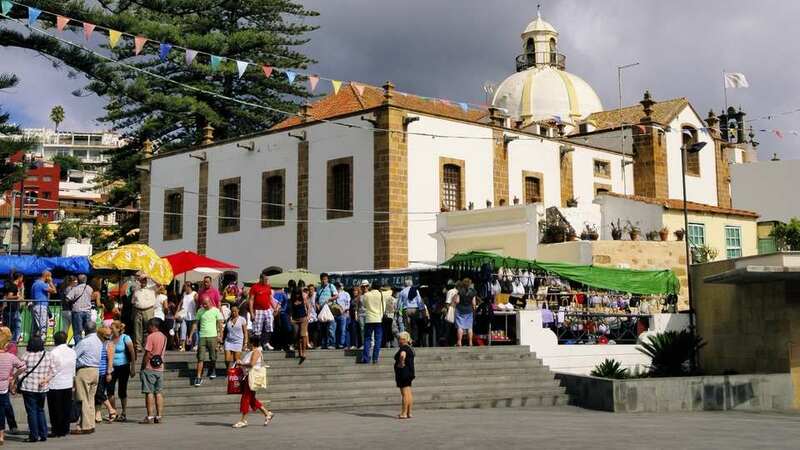 Teror’s Sunday market is the oldest market in the Canary Islands, and is, in itself, a tourist magnet. From 8:00 AM to 15:00 PM, visitors have the opportunity to gain better insight into the municipality. 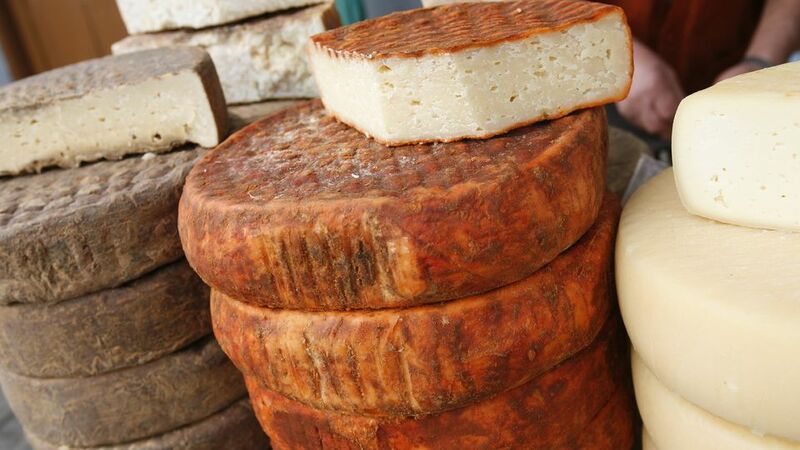 Taste the famous Chorizo de Teror, a spreadable sausage made by the nuns of the Cistercian Order. Appreciate, and possibly purchase, the local handicrafts that make great souvenirs. There are plenty of fresh produce, cakes, pastries, and clothes too. Part of the Doramas Rural Park, Finca de Osorio gives vacationers their nature fix when in Teror. Some tourists traverse this 207-hectare-wide natural site up to its peak. Others, on the other hand, prefer to roam around the area of restored gardens, grottos, and farmland. Nothing beats lazing or relaxing on a lazy afternoon. In Teror, there are places perfect for those purposes. Calle de la Diputación’s cascading water fountain has an undeniable calming effect. Tourists can climb up its steps or just marvel from wherever it’s visible. They may also unwind in the shady Plaza de Nuestra Señora del Pino or Plaza Teresa de Bolívar along with the residents. Every 8th of September, the spotlight is on Teror for the Fiesta de la Virgen del Pino. It is a massive event and the most important religious festival in the whole Gran Canaria. As such, even island residents travel up north to take part. During the second half of July, join the townspeople and get drenched in the Fiesta del Agua. This fun celebration is mainly to give thanks and pray for sufficient rain. They also plea for hunger and sickness to not hit the town. On the first Sunday of May, locals get to showcase their traditions and arts and crafts in Fiesta de San José. Cattle fairs also take place in this festivity formerly known as Fiesta Mayor de Teror. From the San Telmo Station in Las Palmas de Gran Canaria, tourists must ride bus line 216 to the center of Teror. For those who want to drive to Teror, there are two options. The shorter route, a quick 30 minutes, is through GC-3 then GC-21. For those who want to pass by Arucas or see the beautiful northern coast, go through GC-3 then GC-43. Although slightly longer, it will only take around 40 minutes. 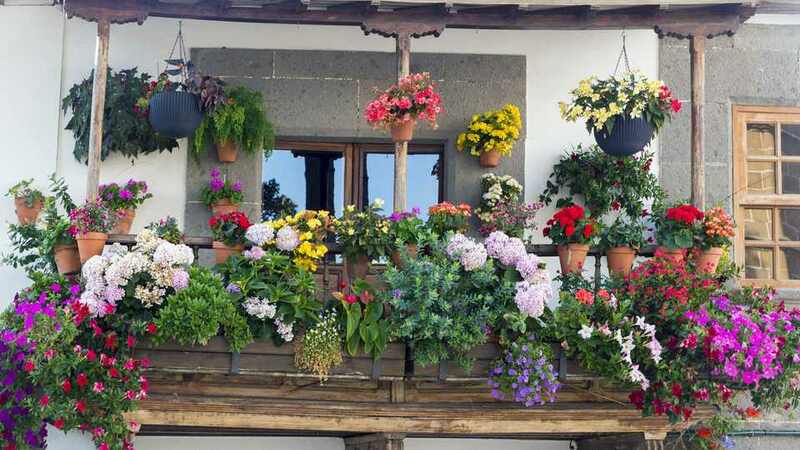 There is but one hotel in Teror, and the rest are rentals of traditional architecture. As such, tourists have the chance to genuinely experience the island’s northern countryside. They may also opt to stay near the town center or nearer to nature. For wanderers who want greeneries everywhere, there are three wonderful and rustic options. La Bohemia, a one-bedroom country house, is perfect for couples and the outdoorsy types. The most popular activities in or near the property are cycling and fishing. For groups or families of up to six persons, Ca’ Chispita and Casa Rural Las Caldereras are rent ready. Both are three-bedroom holiday homes. The prior is set in the Santa Pino Nature Reserve, has a heated outdoor pool and barbecue facilities. The latter, on the other hand, also has a barbecue and a spacious sun terrace too. Casa Rural Doña Margarita is one of the most wanted rentals in Teror. Top attractions such as the Basilica and Calle Real de la Plaza are its neighbors. Which also means it is just a few steps away on the bustling local market held every Sunday. They offer two well-equipped apartments — one is a single-bedroom and the other has two. The food scene in this rural paradise is either reasonable or affordable. Regardless of the cost, Teror restaurants are always prepared to impress hungry diners. For meals, El Encuentro and Pinomaa are the go-to places. Both offer traditional Spanish and Canarian dishes. It is important to note, though, that the former is known as the finest the town has to offer. Between-meal snacks are part most people’s lives, travelers included. So for tiny feasts over coffee or drinks, McFloppy, Bar Nuevo Iris, and Majocaya are superb choices. Lastly, when craving for sweets, head to La Gofrerita Golosa. Waffles, goat milk ice cream, and croissants made this pastry and coffee shop a must-try. Visiting Teror means one thing — easy and slow-paced walking! Why haste when there are so many compelling sights of both natural and man-made around? It’s not a huge town, but there’s a wealth of things to see and people to get to know, in and outside the center. So just keep walking because there’s always more after the last one.